The filling needs to be made the day before. Tart shells can also be made the day before, store in an airtight container. For the filling, heat the crème fraiche with the thick cream (do not boil). Place the white chocolate in a bowl, pour over the hot cream, using a whisk stir until the chocolate dissolves. Cover with cling wrap with some air holes punched in it and leave in the fridge overnight. Preheat the oven to 160c fan-forced (180c non-fan). Use a 9cm round pastry cutter and cut 8 circles from the pastry (you might need to re-roll some of the trim). Line the tart tins with pastry. Cut 8 squares of baking paper, pop these in the tart tins and top with baking weights (or chickpeas). Bake in preheated oven for 10 minutes, then remove weights and paper and return to oven for 2 minutes. When ready to serve whisk the extra 200ml of thick cream until thick, gently fold this through the white chocolate ganache you made the day before. 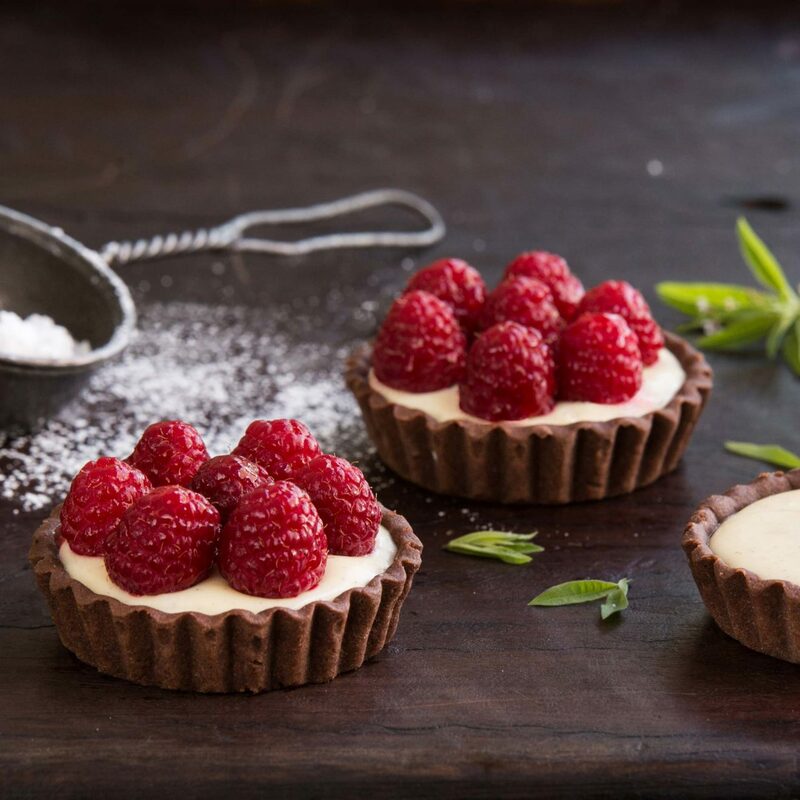 Spoon the ganache into the chocolate cases, top with fresh raspberries and serve.